Week 10 Thursday Game: 13th Man! For the second week in a row, both times at home, Seattle benefitted from questionable actions by the official time keeper – Seattle’s 13th man. In week 8, Seattle trailed Houston 38-34 late in the game. At the two-minute warning, Houston had a 1st and 10 @ the Houston 20. 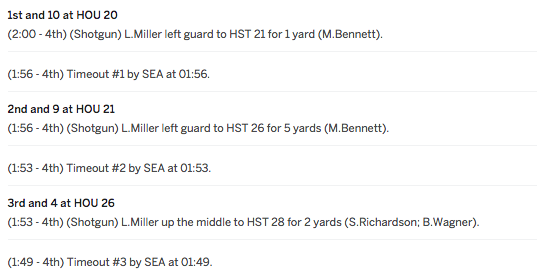 Although Seattle had 3 timeouts remaining, Houston chose to run the ball three times. Very conservative. Probably too conservative the way Watson was playing. They were only able to gain 8 yards on those 3 runs and were forced to punt. Not out of the ordinary so far. But look at the time elapsed between each play. First down: 1 yard run - 4 seconds. Second down: 5-yard run - 3 seconds. Third down: 2-yard run – 4 seconds. Three run plays – 11 seconds total. Pretty fishy if you ask me. In week 9, Seattle trailed Washington 17-14 very late in the game. After getting the Seahawks to the Washington 36 with 15 seconds left, Wilson runs a pass play rather than spiking the ball. After rolling out of the pocket, Wilson gets tripped up for a sack and an 8-yard loss. As he was going to the ground, Wilson throws the ball forward. Clock operator assumes incomplete pass and stops the clock at 4 seconds left. Signal on the field from the officials was a sack prior to the pass. Time should have expired but the inadvertent stop allowed for a replay and gave the Seahawks a final play. The Hail Mary from the Washington 46 hit Jimmy Graham’s hands, but he could not come down with it (shocking!). Lucky for the Cardinals, this game is in Arizona nullifying Seattle’s 12th and 13th man advantages from CenturyLink Field. Without Earl Thomas, the Seattle secondary is nothing to fear. They are undisciplined (16 penalties last week) and give up big plays (let Washington march 70 yard for a score in 4 plays and only :35 seconds for the win). If Arizona can establish the run early with Adrian Peterson, Arizona should be able to control the game and open up the secondary for Fitzgerald & Co.
Home team has won the last three Thursday night games which is why we like the home team in this contest, especially since they are getting 5.5 points.